Stone wall in Salem, CT consists of small slabs of gneiss torn from local outcrop. FIELDSTONE SLAB PROVINCE. The visible difference between walls above and below reflect different combinations of bedrock lithology, glacial action, and cultural handling. Though the contrast is extreme, it illustrates two main points: (1) that stone walls are highly variable, and (2) that the differences can be readily explained. 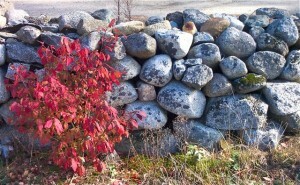 Stone wall of large boulders in Center Harbor, NH. GRANITE MIX PROVINCE. 1 – Island: Located on the massive sandy moraines of southern new England (Nantucket, Cape Cod, Martha’s Vineyard, Elizabeth Islands, Block Island, Fisher’s Island, Long Island, Staten Island, etc.). Walls are built of stone carried south from the mainland and dropped in glacial sand above softer rock of the coastal plain. 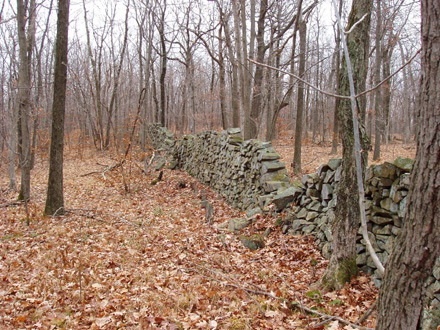 2 – Imported: Coincide with mapped areas of glaciolacustrine “fines,” which means that any stone wall there was built of stone hauled in by humans. 3 – Granite Block: with Shallow Bedrock glacial action. 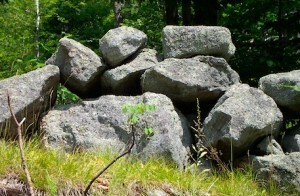 4 – Granite Mix: with Lodgment Till glacial action. 5 – Granite Boulder: with Sand & Gravel glacial action. 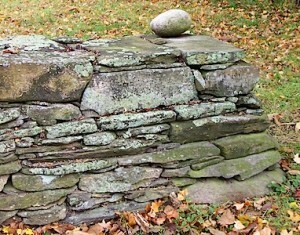 6 – Fieldstone Slab: with Shallow Bedrock glacial action. 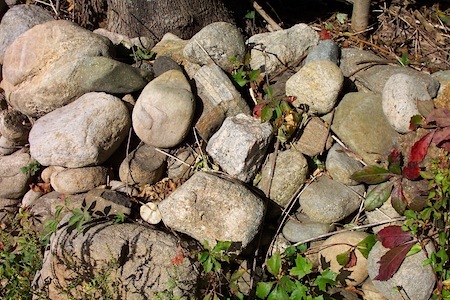 7 – Fieldstone Mix: with Lodgment Till glacial action. 8 – Fieldstone Boulder: with Sand & Gravel glacial action. 9 – Softrock Highland: with Shallow Bedrock glacial action. 10 – Softrock Hillside: with Lodgment Till glacial action. 11 – Softrock Lowland: with Sand & Gravel glacial action. To determine which province of stone wall is in your area of interest, locate that place on the location grid, which maps New England in one-degree latitude-longitude rectangles. To help you get located, I provide reference points, generally cities or popular tourist places. Having found your geographic point, link to each of the three main variables listed above. 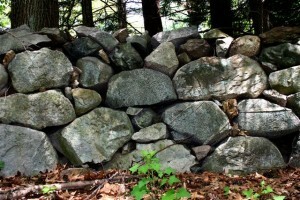 This process is explained on page 118-125 of Exploring Stone Walls. 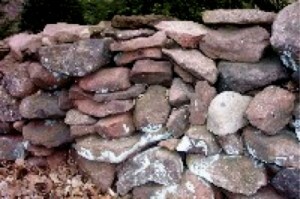 Below are some examples of walls from different provinces. ISLAND PROVINCE: Fieldstone walls at Orient Point, Long Island are generally composed of only of the most resistant stones, which are also quite well rounded. They are survivors of a very long trip. SOFTROCK HILLSIDE PROVINCE. Somers, CT. Jurassic Sandstone. 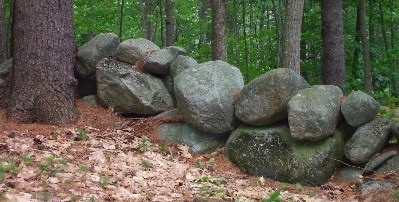 GRANITE BOULDER PROVINCE: Bethel Maine, along the meltwater valley of Route 5. FIELDSTONE MIX PROVINCE. Storrs, CT. GRANITE BLOCK PROVINCE. Gray, ME. IMPORTED PROVINCE (if there were stones, which there are not on this farmer’s cultivation field near Lake Champlain, Vermont.